Oxford Suites, downtown on the Spokane River, features125 spacious one and two room suites with beautiful views of the Spokane River and Downtown. Each room includes a complimentary full hot breakfast and an evening reception where you can relax and enjoy complimentary beverages and light hors d’ oeuvres. Swim in the heated pool or relax in the cedar sauna, steam room, or whirl pool spa. Movie rentals are available in our 24 hour gift shop. Free High Speed Internet in all rooms! 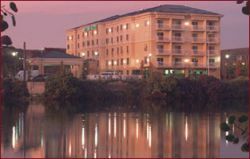 Location: The Oxford Suites Spokane Downtown Hotel provides lodging on the Spokane River near River Front Park and Downtown Spokane shopping. conveniently located near most area businesses!